Spencer lives on...in book form. 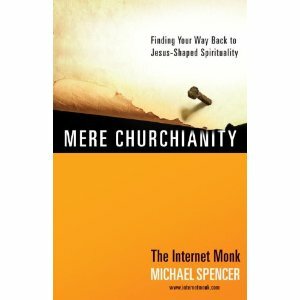 It's been a couple months since Michael Spencer, aka the Internet Monk, passed away after a brief battle with brain cancer. The blog continues on thanks to the work of a handful of other bloggers. I've yet to make up my mind completely about whether I like where things are going over there. Spencer was a faithful and loving critic of his tradition, seeking to get past all the silliness and theatrics of evangelicalism to what he dubbed a "Jesus-shaped spirituality." Now the blog is second-generation, and something always gets lost when that happens. The day many of us have been waiting for is here: Michael Spencer’s Mere Churchianity is now available as an eBook. Those of you who have eBook readers such as the Amazon Kindle, iPod Touch or iPad, Barnes and Noble Nook or Sony Reader can download Mere Churchianity as of today. Download it now, get to reading, and let us know what you think! For those who are still in the dark ages and are waiting for the paper version of the book, it will be available two weeks from today on June 15. However you want to read it, you need to read it. You won’t be disappointed. Indeed you won't. If the excerpt is any indication, this book is vintage Michael Spencer. I think it's actually meant primarily for people who have left the church because they were fed up with the silliness, but I'm betting that churchpeople can get a lot out of it as well. Anyway, this book is basically what Spencer did for a decade or so at Internet Monk: tear down all the unnecessary, wrong-headed, "culture war," jerks-for-Jesus, stage show mentality of the church, and figure out what something more "Jesus-shaped" looks like. In October, ESPN's investigative series E:60 aired his story: A 90-year-old Wauseon man ran a stop sign on State Rt. 2 at Fulton County Road 16 and collided with a sport utility vehicle driven by Brock's father, David Mealer. Mr. Mealer and a passenger, Hollis Richer, his brother Elliott's girlfriend, were killed. Elliott and his mother, Shelly Mealer, were treated for minor injuries at Fulton County Health Center. The elderly driver was charged with two counts of vehicular manslaughter. Brock Mealer received a metal plate in his wrist and 17 screws in his spinal column. And an invitation that may change his life. On a recent afternoon, Mr. Mealer wheeled his way into the University of Michigan football weight facility wearing a blue Adidas T-shirt with the inscription, "Impossible is Nothing." Mr. Mealer is out to destroy the word "impossible." And his most significant step toward that goal was to accept an offer from a few highly energized University of Michigan coaches who enjoy a challenge. Mealer is a grad student at Ohio State who played football for them as an undergrad. Brock's brother Elliot plays for the Wolverines. The challenge that is mentioned is to work with Brock a couple times a week to get him walking again. The goal is to have Brock walking by September 4th, when he'll lead Michigan onto the field before their game with UConn. I just think it's an incredible story that transcends all the usual rivalry stuff. Two Pastors Enter, One Pastor Leaves. On Facebook the other day, I came across a group entitled "Celebrity Deathmatch: Nadia Bolz-Weber vs. Mark Driscoll." I have no problem with this. I think Nadia would cause him to rethink his views on gender inequality in such an encounter. The church has tried to kill the gospel for centuries, but it can't. Yeah. Nadia's pretty much awesome.